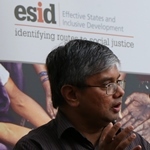 Kunal Sen is Director Designate of UNU-WIDER, Professor of Development Economics and Policy at the Global Development Institute at The University of Manchester, and Joint Research Director of the ESID research centre. Kunal’s current research is on the political economy determinants of inclusive development. His specific interest in this research is to understand the political economy determinants of inclusive growth, and the role of state capacity and political commitment to explain sub-national variation in policy implementation in India. Raihan, S., Kar, S. and Sen, K. (2018). ‘Transitions between growth episodes: Do institutions matter and do some institutions matter more?‘, ESID Working Paper No. 99. Manchester. Kar, S., Raihan, S. and Sen, K. (2017). ‘Do economic institutions matter for growth episodes?’. ESID Working Paper No. 92. Manchester. Sen, K., Pritchett, L., Kar, S. and Raihan S. (2016). ‘Democracy versus dictatorship? The political determinants of growth episodes‘. ESID Working Paper No. 70. Manchester. Dey, S. and Sen, K. (2016). ‘Is partisan alignment electorally rewarding? Evidence from village council elections in India‘. ESID Working Paper No. 63. Manchester. Riciutti, R., Savoia, A. and Sen, K. (2016). ‘How do political institutions affect fiscal capacity? Explaining taxation in developing economies‘. ESID Working Paper No. 59. Manchester. Sen, K., Kar, S. and Sahu, J. P. (2014). ‘The political economy of economic growth in India, 1993-2013‘. ESID Working Paper No. 44. Manchester. Pritchett, L., Sen, K., Kar, S. and Raihan, S. (2013). ‘Trillions gained and lost: estimating the magnitude of growth episodes‘. ESID Working Paper No. 26. Manchester. Sen, K., Pritchett, L. and Kar, S. (2013). ‘The Dynamics of Economic Growth: A Visual Handbook of Growth Rates, Regimes, Transitions and Volatility‘. Manchester: ESID. Savoia, A. and Sen, K. ‘Measurement and evolution of state capacity‘. ESID Working Paper No. 10. Manchester. Sen, K. (2012). ‘The political dynamics of economic growth‘. ESID Working Paper No. 5. Manchester. All ESID working papers can be found here. Kar, S. and Sen, K. (2016). The Political Economy of India’s Growth Episodes. Palgrave Macmillan. Rajesh Raj, S. N. and Sen, K. (2016). is Out of the Shadows? The Informal Sector in Post-reform India. Oxford University Press. Hickey, S., Sen, K. and Bukenya, B. (eds. ) (2014). The Politics of Inclusive Development: Interrogating the Evidence. Oxford University Press. Sen, K. (2013). ‘The political dynamics of economic growth‘,World Development, 47: 71-86. View Professor Kunal Sen’s staff profile. Visit Kunal’s personal website (with links to current working papers and other research).